The Dodgers went into Tuesday evening’s game against the Cardinals trying to regroup from their first road loss of the 2019 season. 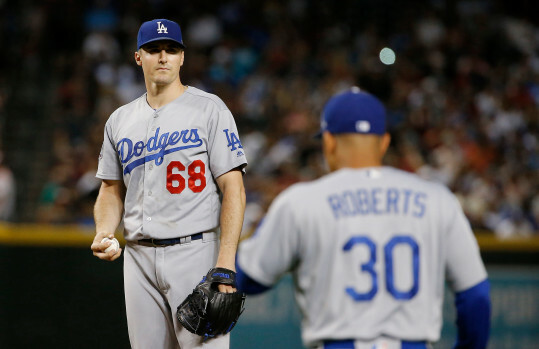 More than anything they needed length from starting pitcher Ross Stripling after Hyun-jin Ryu’s groin injury taxed the pitching staff. The Dodgers didn’t get much from Strip. The right hander turned in a mediocre performance and the Cardinal’s pitching stopped the Dodger bats cold in a boring and lackluster 4-0 loss in the second game of the four game series. The Dodgers drop to 8-4 after the first 12 games of the young season. The Dodgers haven’t had a game yet where they’ve limited the opposition to less than four runs. That’s concerning because the offense can’t score ten runs every night. Strip turned in a thoroughly mediocre performance lasting only five innings and allowing four earned runs on five hits while striking out seven and walking three. Strip made 94 pitches and I guess that was as good as anyone could have expected from him considering it was obvious from the beginning that he just didn’t have it today. The Cardinals did all of their scoring early. Yadier Molina drove in three of the four St. Louis runs with two doubles, one was an RBI single that short hopped the wall in left field in the bottom of the first. The umpires ruled it a ground-rule double forcing Marcell Ozuna back to third base. Molina added another double, that one a two-run double in the bottom of the third to put the Cards up 3-0. Finally Paul Goldschmidt (So sick of this guy) slugged a solo home run in the bottom of the fifth, putting the Cardinals ahead 4-0. Meanwhile the Dodger bats did little to nothing for most of the night. Opposing starter Dakota Hudson tossed 4.2 innings allowing six hits and walking four. However he kept the Dodgers off balance with a nice mix of off-speed pitches. The boys in blue had him on the ropes but couldn’t get the knockout blow. The Dodgers stranded 13 runners on base and were 2 for 11 with runners in scoring position. The Dodgers collected seven hits and seven walks yet couldn’t score. Their best chance of scoring probably came in the fourth inning when they loaded the bases when Max Muncy and Enrique Hernandez singled and the Cardinals intentionally walked Austin Barnes to force the Dodgers hand with Stripling’s spot due up. I felt the Dodgers probably should have hit for him with that being a scoring opportunity that they shouldn’t have passed up. But the Dodgers let Stripling bat. I understood why though, it was too early to pull him. He struck out and the Dodger bats weren’t heard from again. Total meltdown. Everything out of whack, no thanks to Mr. Glass Noodle Ryu, and the taxed bullpen. Stripling could only go 5 innings. Offense was offensive, with 0-11 RISP. Just an all around ugly game. Management set the Dodgers up for failure when they decided to screw with the lineup and give days off. 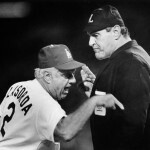 Guilty of taking the Cards for granted after StL got slapped around by the Padres. Not much else you can say. I guess they just got a bit spoiled, opening with SF and COL. Now they must face real pitching and hitting. It’s gonna’ be a bumpy remainder of this road trip. It’s not that complicated. The Dodgers are on the road playing a good team. We are built to beat the weaker NL West teams, and you can count on that happening again. But we aren’t going to sweep through the better teams from the Central and East. And the chances of winning these games is reduced by throwing guys like Stripling out there. He got the loss, and he earned it, but we have to learn how to hit the better pitching in this league. Ozuna’s mis-play was funny though. I’m just telling myself it’s just April. Ozuna’s thing was wonderful in a horrible way. Wow, what a difference between playing in or out of the division! Nice to see that they put Pedersen’s bat into the freezer, nice job management. 90 wins, not a chance. It is way too early to make any judgements. I have been told that numerous times, and in reality it is the one truth. They are off to a way better start than last year. Anyone who honestly believes they could keep up the offensive onslaught they had over the first 11 games is kidding themselves. Games like last night happen to every team, every year. The Dodgers are what they are. Last year the pen shut teams down, this year so far that is not happening. Last night the BP did it’s job, the offense did not. The starter was shaky from the get go and only the umps catching the fact that Molina’s ball hit the back wall kept them from being 2 down in the first. Chicken Strip obviously was off his game and the Birds took advantage of that. Expect more games like that. CK will be back either Sunday or Monday. But do not expect vintage Kershaw. He gave up 2 dingers in his 6 innings of work and his fast ball average was 88-90 range with a couple hitting 92. There will be adjustments to this roster as time goes on, that is a given. But unless guys like Taylor, and Pederson attain some level of consistency, the offense will once again be iffy when the pitcher keeps them off balance like Hudson did. … now Russell to IL. Bad back. Rocky Gale recalled. Don’t expect Kershaw to be the superman savior. He was just pitching to scrubs, and gave up runs, two last rehab start, on HR’s..
Pederson is cold as ice now…. sat on the bench too long. So long in fact that he cannot even hit righties now. CT3 is lost at the plate. Kiké trying to do too much, and making stupid mistakes. Muncy making his rounds around the infield. Way too much to think about, offense suffers. mlb is so watered down, how can you guys watch this and take it so seriously? Just take a break and come back in Aug..
Amen Baba, I have suggested taking a break until September actually. Time to go back and follow my own advice. See you guys in September. Embarrassing loss. 3 straight embarrassing losses. Shall we make it a 4-game swept? Oh well….1st place Brewers’ can’t wait for their chance to beat on the Blew. Baba and True Blue, are you up for a game of Tiddly-Winks?